Charming home just remodeled. One year Home Warranty included. Oversized corner lot with Palm Trees. All new hurricane rated, energy efficient dual pane windows. The roof is 6 yrs old. All new interior doors, closet and pantry doors. Remodeled kitchen features, new all wood cabinets, new counter tops, lighting and appliances. The appliances are stainless steel and never used.. Refrigerator, dishwasher, range and microwave. Complete interior just painted. Large spare walk in closet just off of 3 bedroom. Large interior laundry room with utility sink. Master bath room has new fixtures, vanity, lighting, toilet, mirror and updated tile plus new tile flooring. Back bedroom has it's own entrance and can be easily set up for a mother in law suite or rental. Extra deep single car garage has room for a car and 2 motorcycles or a workshop area. Fenced back yard for some privacy. 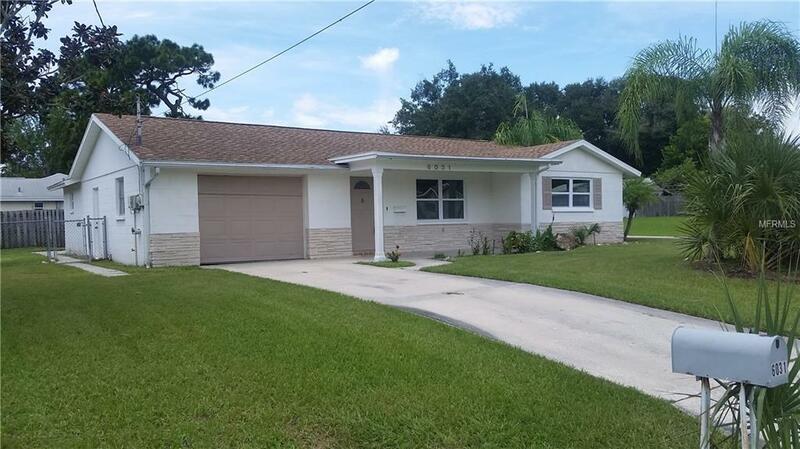 This home is in the downtown area of New Port Richey which features a public boat ramp with Gulf access, many parks and festivities. Home is walking distance to the Middle School. Owner is a Realtor. This is a must see home. Additional Lease Restrictions As Per City And County Laws.